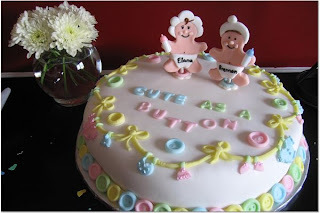 Creative CakeWorks: double the fun! 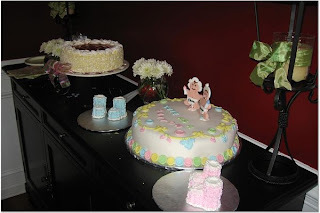 My dear friend Monika is having twins, so I was thrilled to make a cake for her baby shower. The idea came from Wilton's 2006 Idea Book. This is the first time I've completely covered a cake in fondant, so I was a little nervous. I think it turned out to be adorable, though. The babies' names are on their diapers. Monika keeps saying that she didn't even think it was a cake when she first saw it; she just thought it was a really cute table decoration. I loved listening to the "oohs" and "aahs". Trying not to let it go to my head. ;) It's just that when you know how simple it really is to make some of these fondant decorations, it's funny to listen to people talk about how they could never make them. You are truly gifted in this area! Wow, those are awesome! !